Jerry Hankins began designing residential kitchens and baths over 25 years ago, with his first kitchen appearing in (Mar ’91) “House Beautiful” magazine. After five years working for a local and prestigious kitchen design firm, Jerry resigned and founded Hankins & Associates, Inc. soon after in 1992. In 2005, having been a dealer for various production cabinet manufacturers, Jerry wanted to pursue building custom cabinetry and began efforts to assemble a small “in-house” cabinet shop. Timing wasn't on his (or anyone’s) side with the global financial crisis of 2007-08, so his desires and plans were put on an indefinite hold. In 2014, a cabinet shop that Jerry was a dealer for, began to experience difficulties and sadly, soon after were forced to close their doors. 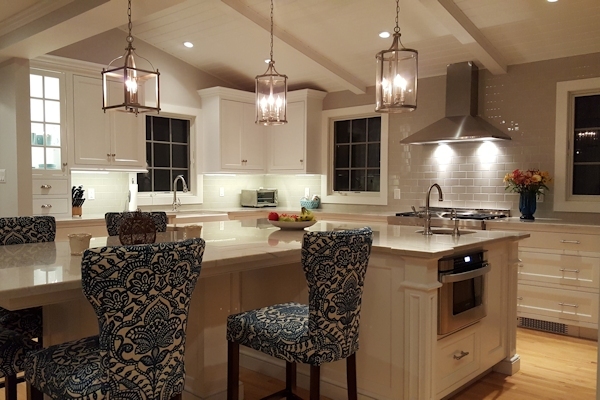 With a great appreciation for that shops quality, Jerry decided it was time to turn his vision into reality, soon after creating a small cabinet shop, officially becoming The Shop Kitchen and Bath in late 2015. The mission of The Shop since its inception is quite simple; provide bench-made quality cabinetry for a fair and reasonable price. Though the cabinetmaking landscape has evolved over the past 30 years, with many more sources for both cabinets and the components making up a cabinet, the desire to maintain a standard that's a cut above the rest hasn't wavered. The Shop uses only quality components starting with Domestic 'formaldehyde-free' plywood. While many shops gave in to overseas imports to save a buck, compromising quality wasn't (and still isn't) an option. Beyond plywood, only choice woods are used in making doors and mouldings, and our drawer boxes are (we believe) some of the finest you'll see and feel. The drawers and doors are joined to the all-plywood carcasses using quality hardware by Blum® and Hafele®. Our finishes are second to none thanks to the preparation, sanding and attention to detail, together with the quality finishing components from Benjamin Moore®. We're not BIG by any stretch of the imagination ... and that's ok. The scale of our Shop (and how we do, what we do) allows us to accommodate virtually any customer request, unlike larger, more rigid production facilities that stick to doing what they do best—shipping hundreds to thousands of cabinet boxes daily. Have a special cabinet design or configuration requirement? Not a problem. Want us to replicate a special trim moulding or door design? Not a problem. Have a special color request? Not a problem. Perhaps you're in the healthcare industry and are in need of exam room cabinetry with custom options that aren't available from the mainstream suppliers. Not a problem. So, we did say "...fair and reasonable price" earlier. Does that mean we're "Cheap"? No, not exactly, but we do believe that the quality we build into every piece exceeds the fair market price for the completed product we provide. Whether you’re a homeowner, architect, builder or interior designer, we’d love to hear from you. Tell us about yourself and the project that you think would be a good fit for us to help you with. Call us today at (215) 794-5930 so we can discuss your needs.